This article looks at the benefits of blue light therapy for acne and explains how LED acne treatment can be an effective way of clearing acne and reducing inflammation. Blue light therapy for acne: what is it? Light therapy is a clinically proven, effective, natural treatment for acne and scarring – blue light kills the bacteria that cause acne. How LED light therapy attacks acne is pretty clever, it literally causes P.acnes to destroy itself! That’s right, unlike other antibacterial or antimicrobial treatments that kill P.acnes, blue light wavelengths penetrates deep into the skin where it stimulates porphyrins (compounds found in acne-causing bacteria). Once these P.acnes porphyrins are stimulated, they generate free radicals (don’t worry – not enough to raise health concerns) which when repeatedly exposed to blue LED light over the course of a few days, have the power to destroy P.acnes. If you’re a long-term reader of this blog then you’ll know that once you’ve got your P.acnes under control, then there’s little room for inflammation and breakouts! Plus, the fact that the P.acnes bacteria kills itself instead of being physically destroyed by creams or lotions, means that there are no unwanted side effects and it’s ideal for those with sensitive skin. Blue light therapy for acne: does it work? Like all other acne treatments, blue light therapy isn’t going to work overnight – but many people see some improvement within 4 weeks and drastic results within 12! It’s also important to remember that blue light therapy will never heal the root cause of your acne. Just like any other topical lotion or potion, it just addresses acne at a surface level. If you’re not actively improving your lifestyle alongside topical acne treatments then the results will only last as long as you’re using blue light therapy. The best, and only way to fight acne naturally forever is to fix the underlying problems. However, this can take up to two years so using a topical treatment that can give you results in 8-12 weeks is a great way of getting back in control of your skin while your body heals. In clinical trials, patients showed a significant improvement in their skin using LED light therapy! In this study, a group of 3 men and 18 women aged between 8-28 years all took part in a study to see the effects of blue light therapy for acne. The subjects had all suffered from mild/moderate acne for an average time of over 13 years and were advised to self-apply blue light treatment for 8 weeks. In just 28 days there was a 50% reduction in blackheads, 41% reduction in papules and 30% reduction in whiteheads. This worked out as roughly 39% reduction in total acne lesions! Pretty impressive for just 28 days and further evidence suggests that acne will keep clearing through month 2, 3 and beyond. As with all acne treatments you have to commit to it. Using it religiously for two weeks then slacking off till you’re using it just a few times a week will not get you results. You need to be using it every day till you’re clear then, and only then, can you start reducing the time spent using LED light therapy – this could be up to 3 months so be patient, be persistent and don’t expect miracles overnight. Blue light therapy for acne: is it safe? LED light does not contain any type of UV light and is completely safe as long as it’s used properly. Blue light therapy can even be used by pregnant and nursing women. In fact, when so many natural treatments aren’t suitable for pregnant women, an at home blue LED light is a great option for any mums-to-be who are struggling with acne. It’s so difficult to trust before/after acne pictures on the internet, especially when they come from the brand itself! There’s one specific acne before/after stock image (this one) that I’m always seeing in leaflets and as soon as I see it, I loose all trust in that brand and product! The brand immediately looses all credibility and quite frankly I don’t want any involvement with a brand that doesn’t use geniune before/after images. The blue light therapy study I mentioned earlier actually published two before/after photos which are totally trustworthy. This one showed quite impressive results and the second one also showed results, but her acne was very mild in the first place. This other clinical study also published a before/after image which shows great improvement using blue light therapy for acne. 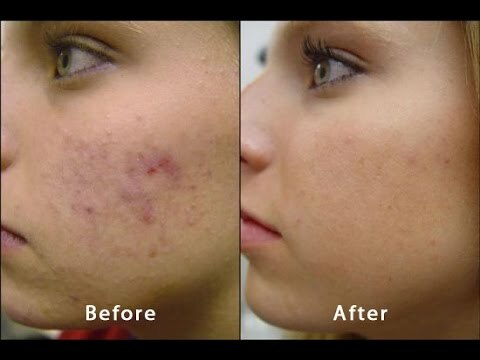 While the severity of acne in these before/after pictures is mild/moderate, drastic results on severe acne can be seen from regular use of an at-home blue light therapy device. These user testimonials (here, here) I saw on Instagram show just how effective blue light therapy for acne can be. Blue light therapy for acne: salon vs home? There’s a lot of conflicting opinions on whether it’s better to do blue light therapy at home or in a salon. Personally, I believe that using blue light therapy everyday is hands down the best way to see effective results. If you remember back to this study, the subjects used an ‘at-home’ device and saw impressive results as they applied the blue light to their skin every day. While an at-home therapy light can be costly at £100-£2,000, an at-home device will be so much cheaper than regular salon treatments which can cost anywhere between £30-£60 per session. Because blue light therapy is so gentle on acne and there are no lasers or chemicals used, it’s perfectly safe to use it in the comfort of your own home so for me, there’s no competition – it’s at-home devices all the way! Do you have to buy the most expensive device on the market? No! I don’t think that a crazy expensive blue light device is that much better than a cheaper device but saying that, I wouldn’t just opt for the cheapest device you can find. Personally, I’ve tried a battery-powered Tanda devices for £70 and also a Lumie light for about £100… the Tanda light was rubbish (the batteries literally lasted less than a day) and the cheaper blue/red LED light just took up so much of my time (more on that later). From my experience alone, I wouldn’t recommend going for the cheapest possible device as quite often the user friendliness, or lack of, will let you down in a big way and you’ll struggle to keep the momentum of daily use. I’ve tried so many different brands of at-home blue LED light therapy devices including Tanda, Lumie and Lustre but by far the most effective at-home device I’ve used is the Tria Blue Acne Clearing Light. Most of the devices that I’ve used take up so much time which made it hard to stick to it every single day for 90+ days. The Lumie, for example, is probably one of the cheapest blue LED lights on the UK market, but it needs 15 minutes exposure per area, per day! When I first started using this device 2 years ago I was using it for a total of an hour a night as I needed 15 minutes on my forehead, left/right cheek and chin/jaw. About a year ago, after trying so many at-home blue light devices and definitely seeing some results with blue light therapy, but struggling to maintain consistent treatments (mainly due to how long I needed to be hooked up to the light each day) I decided to splurge on the Tria device… and I’m so so glad I did! The new and improved Tria Blue Acne Clearing Light is available here in the US for $169, but for those of you in the UK, the wait is nearly over! Clinical studies show that 93% of users reported clearer skin within 2 weeks of using the new Tria Positively Clear device, with a mega 70% reporting that their blemishes had completely cleared! I’ve been waiting for the release of the new Tria device in the UK since March so I’m excited to say that it’ll be launching at the end of THIS month! The new Tria device has so many great features – it will retail for £199 and it requires just 5 minutes per area – this means it can fit perfectly with my daily beauty routine, I no longer had to create time to use my blue light device! It’s also so much smaller that the original version, it’s so compact yet so powerful. I also found that this device (compared to the old Tria) is so much quieter, I can now get my treatment done in front of the TV without bugging my boyfriend! It’s also cordless and the battery life is great – about 4-5 days so you can do your treatment wherever and whenever you need! ** I may have been known to brush my teeth with my right hand AND do my treatment at the same time with my left! ** I cannot explain how great this device is compared to the others I’ve tried. What’s you experience with blue light therapy for acne clearing? Have you seen impressive results using an at-home blue LED device or was it one of those acne treatments that didn’t work for you? Let me know your stories in the comments below!